A new species of British ichthyosaur has been identified using skeletal remains which have been on display at the University of Bristol’s School of Earth Sciences for many years. 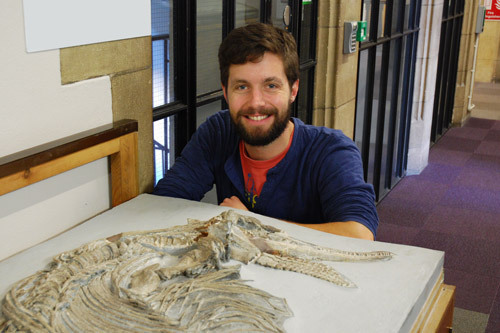 Specimen '25300' (the complete skeletal remains of the large ichthyosaurus found in Walton, Somerset) was donated to the University of Bristol around 80 years ago by the City Museum. Dean Lomax, Honorary Scientist at the University of Manchester, said: "It's quite amazing – hundreds of people must walk past this skeleton every day, yet its secrets have only just been uncovered. "We've named the species Ichthyosaurus larkini in honour of the British palaeontologist Nigel Larkin – the name Larkin actually means 'fierce' so it's quite fitting for a fast-moving predator." Jonathan Hanson, Collections and Practical Manager from the School of Earth Sciences at the University of Bristol, said: "Ichthyosaurs, with their similarities to both modern fish and dolphins, are among the more arresting and captivating fossil specimens known; we are very lucky to have two such specimens on display in the Wills Memorial Building, as part of the University of Bristol School of Earth Sciences Collection. "There is no greater honour for a fossil than to be named as a type specimen for a species, and we are very happy to meaningfully contribute to the understanding of the history of life on Earth by supporting the discovery of Ichthyosaurus larkini."